At AWS re:Invent 2018, we launched the AWS Device Qualification Program to make it easier for AWS Partner Network (APN) Partners to qualify their devices on AWS IoT Greengrass, Amazon FreeRTOS, AWS IoT Core, and/or Amazon Kinesis Video Streams so that customers can find and purchase hardware they can trust for their IoT projects. The Internet of Things (IoT) is the next phase of the digital transformation. Digitizing “things” from light bulbs to industrial manufacturing equipment to smartwatches creates new opportunities for organizations to increase operational efficiency and create new revenue streams. Sourcing reliable hardware and devices for most IoT projects is not only required but also a fundamental part of achieving a successful outcome. With AWS IoT along with our APN Partners and their qualified hardware, customers will be empowered with the intelligence needed to build new services and business models, improve products and services, and strengthen the customer experiences. What Does the Program Solve For? At the foundation of most IoT projects, the need to find and source the right hardware is critical. There’s an abundant amount of hardware vendors and device choices for Amazon Web Services (AWS) customers to sort through, making it confusing where to even start. Additionally, Silicon, OEMs, ODMs, and other device vendors produce a diverse set of IoT devices comprising different CPU architectures, Linux kernel configurations, and device drivers. To validate their devices on AWS services in the past, vendors had to perform qualification testing, which was a time consuming and cumbersome process. Now, the AWS Device Qualification Program enables APN Partners with a flexible, self-service qualification process, easy device submission, and a way to maintain catalog listings. APN Partners can qualify their device’s interoperability with AWS IoT Core, Amazon FreeRTOS, AWS IoT Greengrass, and/or Amazon Kinesis Video Streams through the AWS IoT Device Tester. This is an online qualification tool that automates the qualification process for the most current AWS service versions without the requirement of sending in hardware to AWS, or involving AWS resources in the process. AWS IoT Device Tester also provides the test results to APN Partners so they can upload qualification evidence during the device submission process for AWS Partner Device Catalog listing. The AWS Device Qualification Program creates an opportunity for APN Partners to differentiate themselves and build customer trust by delivering demonstrated AWS expertise with their IoT hardware. Qualified devices are listed in the program’s customer-facing device catalog with links to purchase. This allows APN Partners to reach AWS customers directly while driving adoption of APN Partner IoT hardware and AWS IoT services. What is Available in the AWS Partner Device Catalog? How Do I Get My IoT Hardware Device Qualified? Qualification for the AWS Device Qualification Program is based on technical validation of your hardware through the AWS IoT Device Tester for Amazon FreeRTOS and/or AWS IoT Greengrass, or using the developer resources for AWS IoT Core or Amazon Kinesis Video Streams. 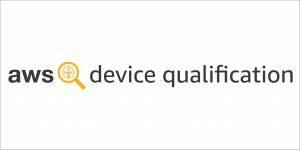 Submit your device for listing in the AWS Partner Device Catalog through the self-service AWS Device Qualification Program Portal. You can draft, submit, manage, and check the status of your device listings through APN Partner Central. Each device submission includes relevant device-specific details, such as technical information, documentation, marketing content, and optional APN enablement links to AWS Quick Starts or AWS Solution Space. You are also required to provide a direct buy link (“Shop Now”) with each listing so that customers can evaluate the listed device quickly and ensure it’s readily available. Device submissions and documentation will be reviewed by the APN team. Through AWS IoT Device Tester, you will receive the test results for you to upload the qualification evidence during the device submission process for AWS Partner Device Catalog listing. Once approved, the device will be listed in the AWS Partner Device Catalog. You can see the steps for each service on the AWS Device Qualification Program page.